In one month’s time, the cycling will begin and the planning will end. This plan has been in the works for so long that it seems strange now that it is so close to fruition. We are definitely ready to finally embark on what, we hope, will be an amazing adventure. As it stands, Rob is now back in the UK and Andrew will return in a couple of weeks. Once everyone is back in the same country it will undoubtedly be far easier to fine tune the details. Trying to organize such a complicated trip when the three participants are on three different continents has been no mean feat. Our ever impending departure means that this blog will finally get some real content on it. Expect updates over the coming weeks and, of course, over the coming months, once we have finally departed. I hope everyone will enjoy reading about what we have been up to and any suggestions are welcome. The easiest way to stay up to date with our blog is to subscribe via email. This means you will receive an email when a new post is published. What rims, frame etc have you gone for? Check out the kit page! It’s a similar build to Andrew’s, but the main difference is the wheels. 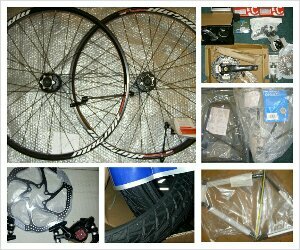 I have gone for ultra-strong (but quite heavy) 36 spoke Mach 1 Magma rims with Shimano 525 disc hubs.